Aquila Learning is a new UK startup, led by former Royal Air Force officer Mark Radbourne. Its mission is to apply military training rigour to any high-risk industry where the actions of individuals have a direct bearing on people’s effectiveness and safety in the workplace. Across aviation, shipping, rail, health and the energy sector, each market — and often each organisation — has its own particular way of assessing and managing people’s training needs. But without consistent, systematic application of needs assessment, planning, delivery and follow-up, the risk of incident looms large. Aquila Learning has set out to address this gap with a comprehensive, world-class process for managing training — embodied in an intuitive software system which is easy to deploy and scale. 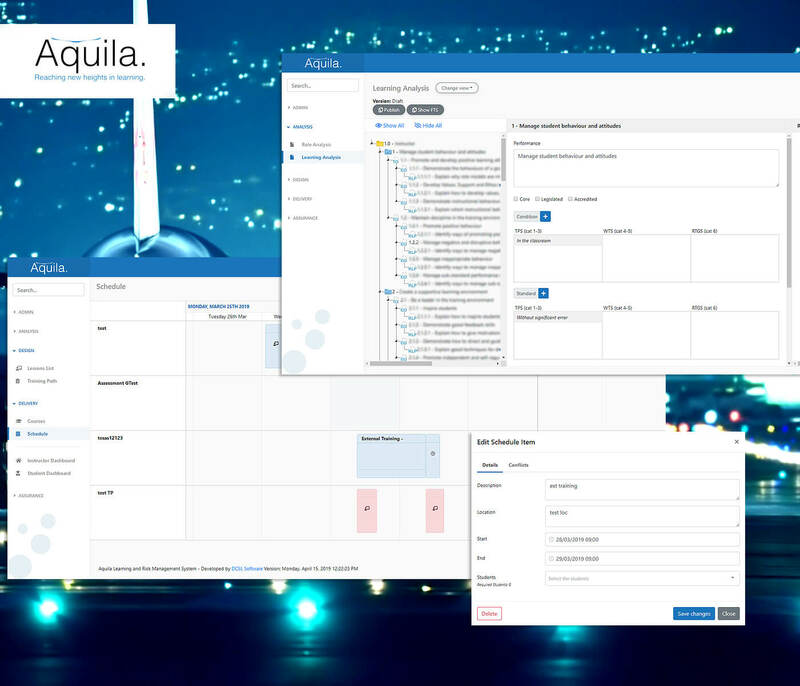 Aquila knew exactly what it wanted, but needed a software partner to translate this vision into a powerful yet easy-to-use product. The team shortlisted three companies, knowing they wanted to work with someone in the UK, and preferably local. They had everything – the location, the longevity and the right size, team and skills to take on this project. Their iterative, collaborative approach to development was ideal too. Being able to meet regularly was key to getting this right first time. Read more. The system needed to be flexible and adaptable, too. Although the first use case would be within the military, for the MoD, Aquila wanted it to be readily customisable for use across a broad range of other high-risk industries — as applicable to oil, gas and nuclear industry engineers as to the training of pilots. The ergonomics are fantastic: everything feels simple, uncluttered, easy to use. Read more. The system DCSL has developed spans four critical stages in the training management lifecycle — Analysis, Design, Delivery and Assurance — and includes some standout features at every phase. At an analysis level, for example, the ALaRMS software automates hierarchical task analysis, producing very complicated role data very quickly — from tens of thousands of interrelated data points — and highlighting any gaps. The scheduling function, meanwhile, optimises not just instructors’ time but also the use of expensive equipment such as simulators. Finally, the assurance capability enables users to run elaborate risk analyses over historic data to further inform risk management. At the MoD, which has begun using the first iteration of the software to support training on the Poseidon MRA Mk1 Maritime Patrol Aircraft (MPA) at RAF Lossiemouth in Scotland, ALaRMS is proving a game-changer, allowing highly complex training systems to be managed and assured safely, effectively and efficiently. Commenting on the system, Squadron Leader Rich Jones of RAF Lossiemouth says that having an application that was specifically built to manage and assure aviation training, end to end, is highly beneficial. “We can achieve so much more in a short amount of time, knowing that the training we produce is compliant with military training principles, and is fully optimised,” he reports. Following the RAF rollout, Aquila will adapt ALaRMS for broader application, across other high-risk industries. DCSL Software’s role, for now, is complete. It’s a great relationship, which will continue: I wouldn’t hesitate to work with DCSL again, whether for additional development work or a new project. They’ve been instrumental in producing our first product, and are a very valued partner. Read more.